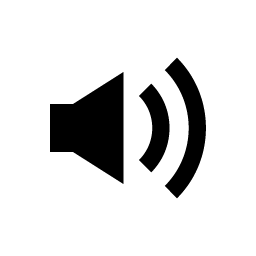 German Rottweiler vs. American Rottweiler: some claim there are variations of Rotties, the German Rottweiler and the American Rottweiler. 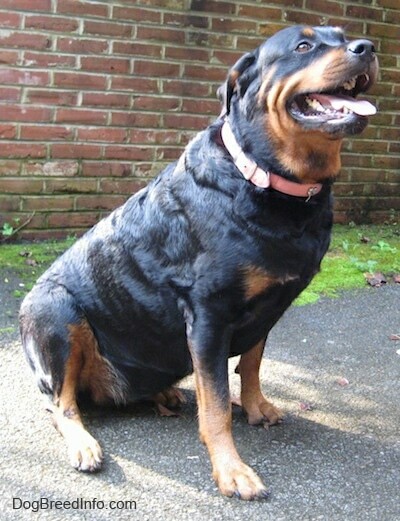 German Rotties are said to be shorter, stockier and have a bigger, blockier head, while American Rotties are said to be taller and leggier without as blocky a head. 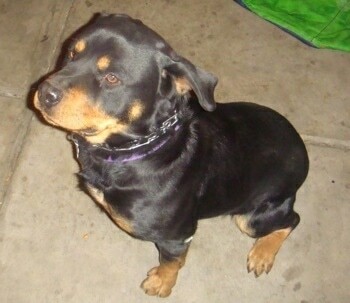 Others claim a Rottweiler is a Rottweiler and there is no such thing as a German Rottie. Some who have stated this argument have said, "A German Rottweiler is one born in Germany and an American Rottweiler is born in America." 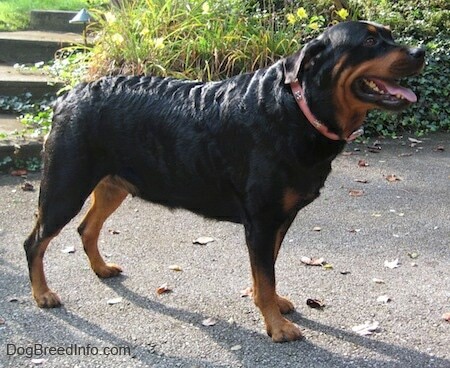 In any case, there are breeders breeding for the German Rottweiler look of larger and blockier, while others are breeding for the American Rottweiler look, less blocky. The Rottweiler needs plenty of exercise. You can't give these robust dogs too much work or exercise; they thrive on it. They need to be taken on a daily walk or jog. Running in the woods and in open country makes them very happy and they have no desire to wander from you. Swimming or running beside a bicycle are perfect activities for this dog and it also loves retrieving a ball. 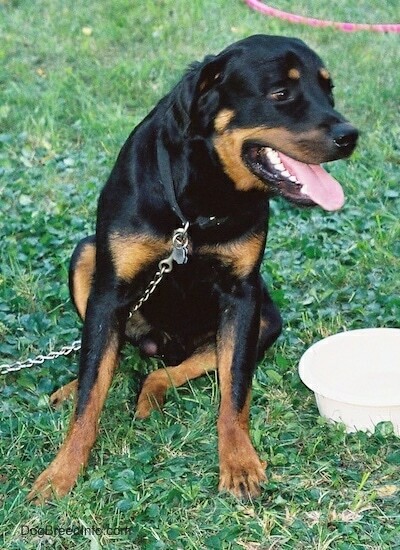 The Rottweiler is probably descended from the Italian Mastiff, which accompanied the herds that the Romans brought with them when they invaded Europe. During the Middle Ages, it was used as a herder, as a guard, messenger dog, draught dog and for police work. 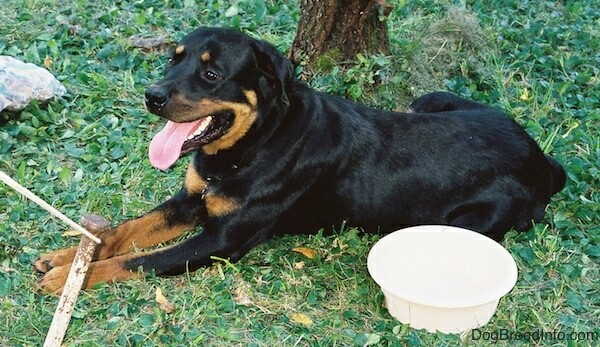 It was bred in the German town of Rottweiler in Wurttemberg. Practically extinct in the 1800s, the breed population began a comeback in the early twentieth century due to the efforts of enthusiastic breeders centered in Stuttgart. 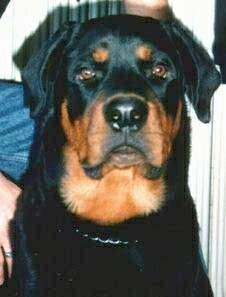 In Germany on January 13, 1907, the DRK (Deutscher Rottweiler-Klub (German Rottweiler Club)) was established. 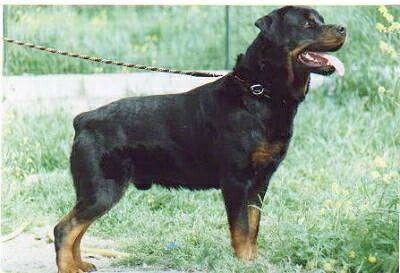 Shortly after on April 27, 1907, the SDRK (Süddeutscher Rottweiler-Klub (South German Rottweiler Club)) was formed, which later became the IRK (International Rottweiler Club). 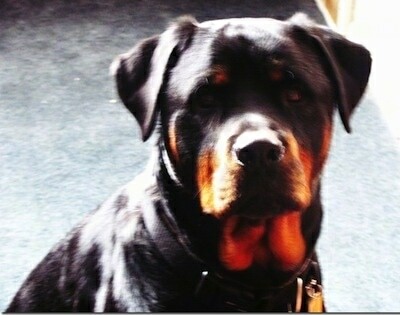 The Rottweiler standard was then set. The breed was first recognized by the AKC in 1931. Some of the Rottweiler's talents include: tracking, herding, watchdog, guarding, search and rescue, guide dogs for the blind, police work, carting, competitive obedience and Schutzhund. 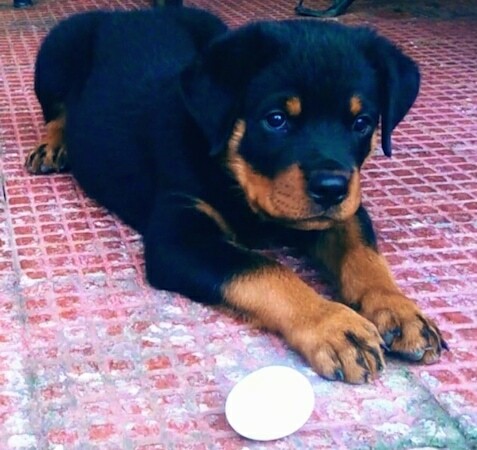 Max the male Rottweiler puppy at about 7 weeks old—"This is my Rottweiler Max. He is shown here at 48 days old. He is really an obedient fellow but a bit headstrong too. He has a lots of energy so I take him for atleast 3 walks per day. In this pic he is sitting patiently for me to break the covering of that hard boiled egg, because he can't do it on his own lol. I just love him." Hercules, Harley, Hannah and Angel the Rottweilers—"I took this photo with the help of some grilled chicken. Hercules (almost 2) is the clown of the bunch. Harley (2 years old) is the enforcer. Angel (about 8) is the mom figure and a rescue. Hannah (about 2) is another rescue that has all the energy. They go for walks almost every night and to a huge cornfield to run about twice a week. They sleep inside at night and don't really disturb anything. Cesar Millan has been a great contributor to the training of these dogs. Herc and Harley went to obedience school and with the help of watching The Dog Whisperer, they have turned out very well. This breed is one that wants to please it's pack leaders. You should be in good physical shape to own these dogs as their strength is sometimes overwhelming." 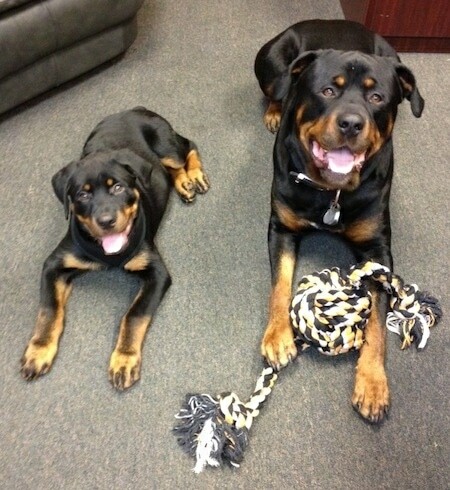 Royce (left) the Rottie puppy at 5 months old with Barracuda aka 'Cuda (right) the adult Rottie at 3 1/2 years old—"'Cuda is a very tall Rottie and weighs 139 pounds. Royce weighed 115 pounds when he was 11 months old and is taller than his brother! I wish Royce was as laid back and as well behaved as 'Cuda, who goes to work with my husband every day. No leash is needed and he is extremely friendly and social. Royce, on the other hand, is a ball of energy. Absolutely wild, but friendly. He cannot sit still and loves to play with 'Cuda, who will interact willingly until Royce crosses the line and nips his ears. Never a fight between them, but Royce knows when to back off. Just hoping time and patience will settle him down. I love them both and would never own another breed!" 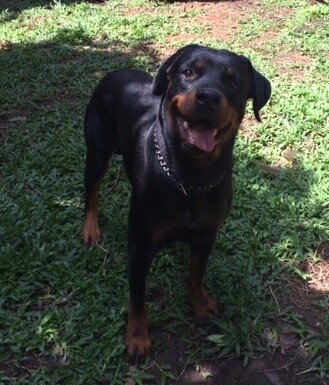 Ruckus the Rottweiler at 3 years old—"He is friendly and clownish and loves to cause a ruckus and that is how he got his name." "Tyson was saved right before being sent to the pound in Feb. of 2008. He was kept in a cage in the back of a house and was a little wild when we got him (9 months / 80 lbs). 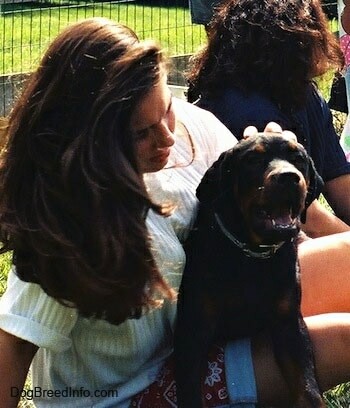 Being my first dog, I was very excited. He caused trouble around the house, chewing things up until I realized that he had an extreme amount of nervous energy (thanks, Cesar) and needed more exercise. Now we go for long walks, he runs next to my bike, pulls my skateboard, plays at the dog park and even tries to herd cattle at my fiancé’s family farm. He is now 1 year and 8 months old. He went from no discipline to following almost 20 different commands. It’s amazing and he is incredibly smart. He’s also so in tuned with me and responsive that I never need a leash. He won’t go very far without watching to make sure he knows where I am. Walking up a steep hill once, I fell and he came sprinting to make sure I was okay. Through a lot of dedication and research, he has become a very well-balanced dog. He doesn't get too excited, is never aggressive and hardly barks unless commanded to or if he is startled by something. I have applied numerous Dog Whisperer techniques and all have proved successful. Sit, stay, come, down, downstairs, no, up, outside, inside, lay, ok, go get it, get your ball, go see, too far, heel, speak…. These are some of the things I was amazingly able to teach this dog. Have you ever seen a Rott walk backwards? Mine will. He makes us laugh every day and provides us with a great sense of security. This may be a biased statement, but he’s the best dog that has ever lived." 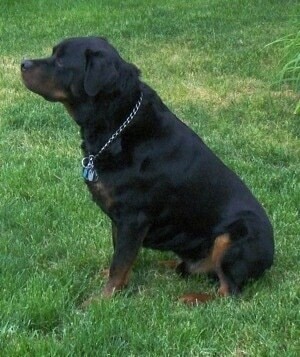 "This is my recently departed male Rottweiler named Hank (11?). He was adopted through the local shelter when he was about two. The previous owner beat him and accused him of not being "mean enough." "I have read Cesar Milan's books and apparently Hank had already read them, because I could not pinpoint any bad habits to correct. We would take frequent walks and although he spent way too much time smelling things I was good with that as I have to slow down, too. He almost always stayed close to me and didn't like to let me out of his sight when we were gardening. He would survey the neighborhood and make sure the kids were having fun. Just in case there was someone with a free hand or a tennis ball he was ready. Hank very rarely barked, but did talk to me if he needed to go out. He was calm and knew that Mama had it under control. Strangers were amazed that on command he would stop what he was doing and sit and stay, even if another dog or cat caught his eye. If I needed help he was there. "He slept in the sunroom on his own bed with plenty of ventilation and sunlight and heat in the winter. He jumped on my bed only once and figured out quickly that he wasn't invited. While I worked on the computer or watched television he would lie at my feet and relax. I think I have been truly blessed to have had a great companion such as Hank." 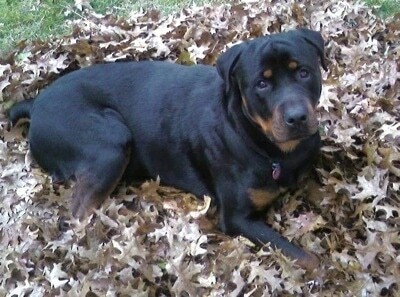 Bear, a male Rottie at 1 year old standing out in the yard.